How to Use Your VPN to Watch the World Cup Live? The more things change, the more they stay the same… it’s 2018, and the Germans will try to defend in Russia what they have gained four years prior. The stakes might be somewhat smaller than 75 years ago, but they are far from being insignificant, as only one nation can bring back home the World Cup. As each nation is only allowed to field eleven men this time, and most of us have neither the time nor the resources to get to Russia in person, we will have to cheer for our countries and our favorites over the screen. Using a good VPN service, you can stream live sports from any region in real time. As different countries have outlets that will live stream different games, you can use the advantage of Le VPN to change servers between countries, as to see exact matches that you want, no matter where you are. Which Countries are Streaming the World Cup Online? 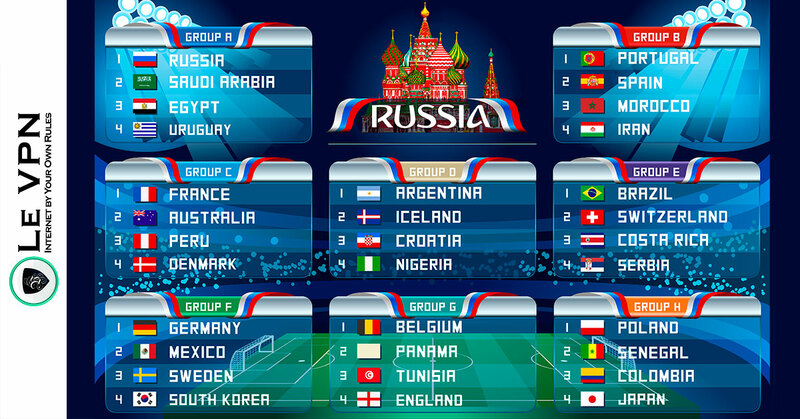 With 32 teams in the group stage, each country represented will surely follow their home team, as well as those they deem would be popular in their country. Larger networks will stream all games but will usually need a paid subscription for those that are not on the main channels, meaning that you will need to switch your VPN server to another country to see the game. Even those countries that didn’t qualify will not miss out on the games, usually following their neighbors and gold contenders, so we will have a large selection of streams to choose from. This means that we can be picky about the distance of the VPN server we are selecting, and the language we want to hear our commentary on. 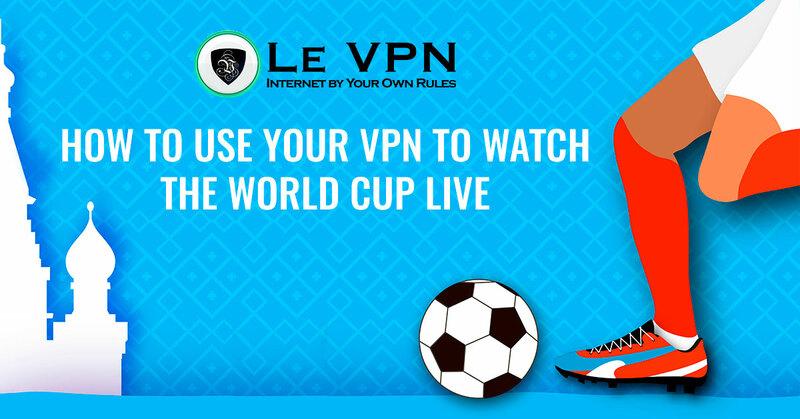 As Le VPN offers the connection to servers all over the world in over 100 countries, you will be able to watch all the games, in high quality, with ease. How to Watch World Cup Online? To be able to watch matches live online for free, football fans will have to switch their virtual private network to a country that is streaming the game, and then select one of the free streaming services that are available in that country. For most countries, there will always be a public broadcaster that will stream that country’s games, and major TV broadcasters will have most games covered over their website. There is also a selection of streaming sites that are available from certain countries that will offer all the games for free, but with diminished quality, which might be something to consider as a last resort if your desired game is streamed in your desired language. After you have your VPN switched on, your stream selected, and your snacks at the ready, you can leave the rest to the boys on the field. While setting up the VPN will not be stressful, we cannot guarantee the same for the watching of the game. Why Do I Need a VPN to Watch? For anyone who is at least a bit familiar with FIFA, they know that FIFA doesn’t do anything for free, and the fight for advertiser rights is a much dirtier game than the one on the pitch. Because of this, countries restrict access to their live streams only to people who are accessing with a domestic IP address, as not to harm other FIFA countries who have also bought rights to the game. This is a problem for anyone who is either traveling or just wants to see the games other than those from the country where they currently reside. Thankfully, with Le VPN you can choose to access websites from servers in over 100 countries, masking your IP address as to allow you to see the game you want to see. Although team USA will not be competing for the World Cup this year, this doesn’t mean that fans will be neglected. There are a number of games to look forward to, for multiple reasons. Mexico will face off Germany on Sunday, the 17th of June, and there is a lot riding on this first game for both countries as Group F will not be a breeze. Also, the Socceroos will go against France one day before, on Saturday, and it will be interesting how the team from down under matches with the 1998 winners. Even those outside of the US will probably want to tune in their VPN server to the States, as the commentary is usually very informative, and it seems that American sports commentators know more about the sport than most countries who were the World Cup winners. Those connecting to the US VPN server will have an option between FOX Sports, which will stream all games either on their primary channel or on FS1, or Telemundo, which will do the same, but with commentary in Spanish. This comes to your preference, as both streams are available in HD, with prime commentary. Telemundo will be covering the whole tournament, either from their primary channel or the sister channel Universo, with game discussions directly from their studio in Miami. With over 500 hours of television on schedule, this is certain to be a great debut for the network, live streaming in Spanish and open for comments from social media. FOX Sports is a known name, and we know what to expect. They will open with the Russia vs. Saudi Arabia team on Thursday, and there will be as much pregame content and postgame analysis as FOX can manage to dig out, which is usually quite a lot. Le VPN has developed state of the art VPN apps for Windows, Mac, Android, and iOS, meaning that no matter the device, you will always be able to access any content over them as a VPN service provider. In most cases, you will be able to watch the online streaming directly from the TV channels that stream the games on their website, but in the case of iOS, you will be required to download the FOX app for the platform, where you will be able to view the games on your iPad or iPhone. As the Le VPN app requires very little resources to run on any device, it is unlikely that you will experience any lag or slowdown of your device. It’s the football world cup, and that means that you will be leaving the Union Jack at home as there is no such thing as Britain here, only England, proudly trying to bring the cross of St. George on the top of the stage again after 52 years. Aside from waiting for the kick off against Tunisia on Monday the 18th of June, blokes back home are eagerly waiting for the match on Saturday before, between Australia and France. The British Broadcasting Corporation will put those license pounds to good use both streaming over their website and through the BBC iplayer. While some Englishmen will watch the Aussies as to root for them, it is much more certain that more will watch as to see France lose. Aside from the public broadcaster, all England games and most other games in the group phase will be streamed over the ITV website, but only for domestic audiences using a UK IP address. Thankfully, Le VPN has a server in the UK, so you would be able to watch England, either because you are an expat, or because you enjoy the UK commentary. As BBC provides coverage of almost all sports played throughout the commonwealth, in the case that England doesn’t fare so well, there is a possibility that not as many matches will be streamed until the finals. Both English expats, and those living in the UK and wanting to see more games, they will be able to switch to a US or Australian VPN server and watch all games unavailable to them from there. Le VPN has a downloadable VPN app for Windows, Mac, Android, and iOS, meaning that no matter the device, you will always be able to access any content over them as a VPN service provider. Users who can’t run Flash Player, which is how most media is streamed, should use the BBC iPlayer system, which uses a more integrated streaming service and is able to be used at the same time as the Le VPN app. Although the Flying Moose will not be joining us in Russia, this doesn’t mean that the Canucks should be prevented from watching high-quality football from the comfort of their home. With 3 major TV channels providing streaming services in Canada alone (CTV, RDS, TSN), the question is only which language you prefer. Connecting to a Canadian VPN is very easy, and the app will refer you to the server that will be the fasters depending on your current location. Wherever you are in the world, you will be able to watch high-quality Canadian television from any device. As both Canada has fans around the world and Canadians are fans of many nations around the world, there will be something good to see every day. Opening day is always fun, even for people for are not strictly football fans, and after that, there is Span vs. Portugal in Montreal lunchtime in Friday the 15th, and brotherly Australia playing France the day after. With streaming channels offering free access to any user with a Canadian IP address, it is certain that you will be able to watch live matches both during the group phase and later in the knock-out. This is not only good for Canadians living abroad, but also for any Francophone person worldwide who appreciates RDS and the Quebecois approach to sports commentary. Combined, all games will be available for streaming over the websites of mentioned tv stations, with RDS giving preference to Morocco, France, and Belgium, and others focusing on England, Australia, and Mexico. Football is a passionate game, and you should use a VPN to switch to a free broadcaster that will not root against your team. With the downloadable app for Windows, Mac, Android, and iOS, no matter the device, you will always be able to access any content over Le VPN as a VPN service provider. 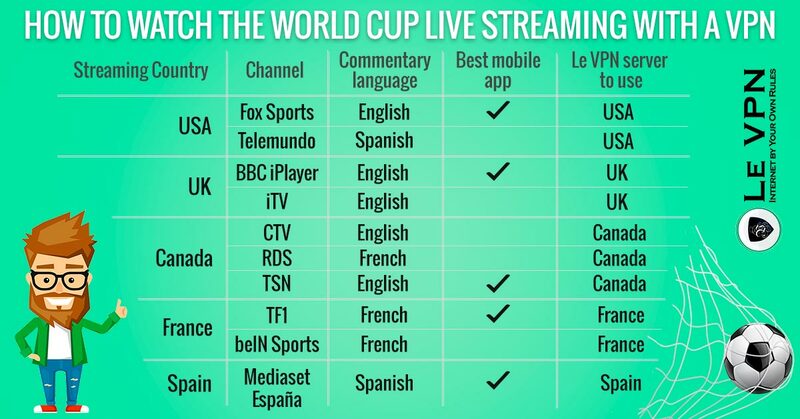 While TSN does allow streaming over their iOS app, there is no such availability for RDS, meaning that iOS using football fans who want to watch the games in French will have to opt for a different VPN server that has a streaming app, like the French TF1 which has a similar schedule. The Blues have had an interesting qualifier and now the French are marching on Russia yet again, this time prepared to go to the end. With the kick-off against the ‘Roos on Friday midnight, the Republic is expecting a lot from this year’s team. Every single match of the French squad will be streamed for free on TF1’s website, with all other games being streamed on beIN Sports, including the match between Morocco and Iran the day earlier and the Swiss playing Brazil on Sunday morning. Both TF1 and beIN Sports have prepared a lot of content for this World Cup, and those following the World Cup online will be able to see both the pregame commentary and the post-game analysis of every game streamed, directly on the website. Both the French living around the world and all other Francophone people globally will be able to enjoy hours upon hours of high-quality television that will follow the World Cup. As Le VPN has one of their strongest servers located in France, providing you the ability to watch live matches in good quality for free. Le VPN has a downloadable app for Windows, Mac, Android, and iOS, meaning that no matter the device, you will always be able to access any content over them as a VPN service provider. For those using an iPad or another iOS device that doesn’t support Flash Player, TF1 has a high-quality streaming app for iOS, giving you the option to watch your games from there. On Friday, 15th of June, La Furia Roja will try to establish itself as the football ruler of the Iberian Peninsula, in the match against Portugal. Obviously, after Portugal, the goal is the world. Eight years have passed since Spain was on top of the world in South Africa, and Sergio Ramos must be more than eager to feel that taste again. For Julen Lopetegui this will be the challenge of a lifetime, but one that he is not unfamiliar with, as he assisted Spain to reach the ¼ Finals in the 1994 World Cup in the US, where his team lost to Italy. Whatever the outcome, Mediaset España will be covering all Spanish games and most from other countries, especially in South America. As Mediaset is an experienced player when it comes to the World Cup, we can expect high-quality content throughout the Mundial. Mediaset España will provide all users with a Spanish IP address free access to their live streams or through their app. While the program might be good, the stream quality is sometimes lacking so it is advised to have at least one other option at the ready. If you are having issues with the stream, you can either switch to some other Spanish speaking network, or to Portugal as their RTP will be streaming the match as well, if you don’t mind the potato. With the downloadable app for Windows, Mac, Android, and iOS, no matter the device, you will always be able to access any content over Le VPN as a VPN service provider. For those using mobile devices, it is good to know that Mediaset Sport has apps for both iOS and Android, which are very stable and will provide live streams for people using handhelds. As Le VPN has VPN servers in 114 countries, covering almost all geolocation on this planet, option for anyone watching is not limited just to the countries they are living in or the ones they come from. All countries represented will follow their national teams using their public broadcasters, and this means that there will be something for everyone, in any language. If you are far from the countries mentioned you can see which country that broadcasts in your language is the nearest and select that country, using their national broadcaster to watch the world cup online for free. As to make your viewing experience as good as possible, ensure that your local connection is stable and adequate to stream video, as well as that you are using a flat-rate paid internet, as per data used plans can become very costly this way. Finally, enjoy the coming world cup, and may the best squad win!